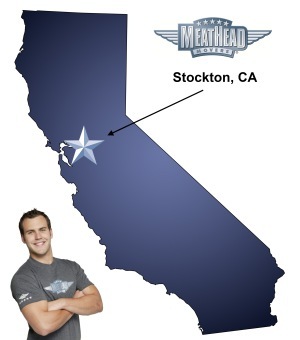 Meathead Movers is here to take care of the heavy lifting for you on your move to Stockton. Our clean-cut student athlete movers are ready to get you safely settled into your new Stockton home. Located in the heart of the Central Valley, Stockton is within driving distance of all that California has to offer. With Stockton as your home base, you can easily drive to San Francisco, San Jose, Lake Tahoe, Yosemite National Park and numerous wineries. This vibrant city has plenty of fun things to do on its own. You can enjoy water skiing and sailing in the delta, or you can also visit the theater, opera and various sporting events. If you are considering moving to the area, our Stockton movers can assist you throughout the process. Founded during the California gold rush, Stockton’s waterways were used to transport supplies to neighboring mining communities, and the city continued to grow long after the gold rush ended. The area’s fertile soil and temperate climate are perfect for growing asparagus, tomatoes, almonds, walnuts, and cherries. The Port of Stockton was California’s first inland seaport, and it continues to be a major gateway from the Central Valley to the Pacific Ocean. Stockton has also been the location for several well-known movies, so if the area looks familiar, you have probably seen parts of it on the big screen. The city is also home to the University of the Pacific, which has an excellent academic reputation and has also been the location of several films. Scenes from “Raiders of the Lost Ark” and “A Sure Thing” were filmed at the university. When you trust your move to Meathead Movers, you can rest assured knowing that your valuable belongings will be treated with the utmost care. Our moving company specializes in local, long-distance, and commercial moves to, from, and within Emeryville. Our employees are reliable student athletes, who are clean cut and drug free. They keep in shape, and they know how to hustle. In fact, they’ll even jog when not carrying your items, to ensure that your move is fast and efficient. Additionally, if you need assistance locating other service providers in the Stockton area, we would be more than happy to help with referrals through our complimentary moving concierge service. To get a free moving quote and experience the Meathead difference, call our office today. With our 100% satisfaction guarantee, the only thing you have to lose is the stress that comes from moving! Moving to Stockton? Here are some helpful resources. The two gentlemen were quick, efficient, pleasant, and very understanding. Nate Brown kept me informed every step of the way. We will definitely be recommending your company to anyone who needs to move. Very efficient with time management for the most part. Very polite and great customer service. Easy to contact & work with. Movers were super pleasant. The young men who helped me exceeded my expectations of an efficient and safe move. They were all respectful, courteous, and kind. I am so grateful. The move was an emotionally exhausting experience for me regarding my own family circumstances, and these young men helped make a smoothe transition possible. If I ever move again, I expect to call Meatheads! Thank you for excellent service at every step from the first call to the last! God bless you all. They were wonderful! Everything was c?ompleted in an efficient and accommodating way. Very friendly, clean, and fun group. I would hire them again if I moved. Thank you so much.